On April 19, the Bion-M1 satellite lifted up on a Soyuz 2-1a rocket from Baikonur. Five days later, there was one favorable pass of the spacecraft over my observing location in the south of the Netherlands. The ‘Space Zoo’ passed almost directly overhead, ironically enough through the stars of the Big Dipper. The resulting images of this Bion satellite showed a surprising resolution. At a range of 581 kilometers and an altitude of 575 kilometers, the small spacecraft with a comparable design to that used for the early Vostok flights, is a really small object. But the images show a comparable detail level to that of my Progress/Soyuz images at the altitude of the ISS, at a 175 kilometer lower altitude. 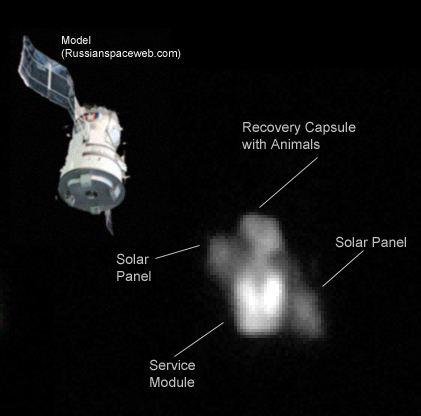 We see the service module and the recovery module (the capsule) clearly resolved and also some parts of the solar panels are visible in the image, which was obtained with a 25 cm aperture reflecting telescope and manual tracking. As seen visually through the tracking scope, the satellite showed a reddish color; in fact, we see a sign of the golden foil that is wrapped around many satellites, including the Bion-M1. 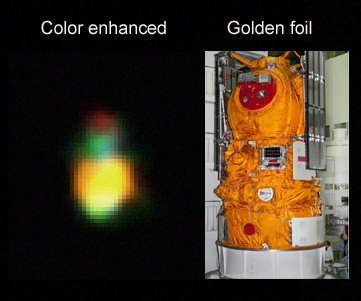 The video camera attached to the telescope at high magnification revealed the golden color better, especially in a color enhanced version. The recovery capsule – also visible in this ground-based image – reached the ground in Orenburg, Rusland on May 19, exactly a month after launch. At the time that I observed this Bion satellite I had no idea that some of the passengers actually would not survive the trip into space.